Washer design contributes to the weather seal of a fastener. We offer several washer options based upon the type of fastener and the application requirements. 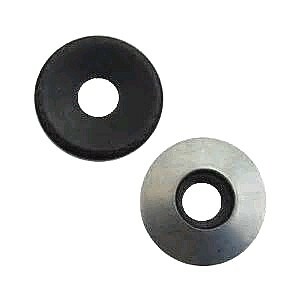 Whether you need a steel washer, brass washer, or plastic washer, we have it here at BestMaterials.com. Please make sure you also check out our different variety of washer sizes and styles too! EPDM rubber captured under a stamped "dome"
* Proper installation techniques should always be employed.